Kelly's Korner: Where had the time gone? Saturday night - Scott and I ordered a pizza and watched "Drillbit Taylor". The movie is pretty much about some high school bullys and I was telling Scott I would not want to go back to high school for anything. College, yes - in a minute, but high school no. I had a great high school experience. I grew up in a tiny town and graduated with 50 people (and that was one of the biggest classes). I got to be apart of anything I wanted to do - cheerleading, FBLA, national honor society. The kids in our town go to a high school that is bigger than my college was. It's HUGE. I can't imagine going to a school that big. This is part of my class at a graduation brunch at my house. We were the class with all the fun - we were the class of 91. ha! This is my sophomore year of cheering. If we spent half as much time on our cheers as we did on fluffing our bangs and spraying them stiff - we could have been a championship squad. This was the best part of high school to me - cheering. I loved it so much! This is a bunch of us at our 10 year reunion. Since our class was so small - we had a joint reunion with the class in front of us and behind us. It was so much fun. I put it together and I will never do that again. But I do hope someone organizes a 20 year for us because it's fun to see how people have changed or not changed and what their families look like. I truly liked all the people I graduated with and I love running into them. At our 2o year reunion - there will be a lot of my classmates who have 19 or 20 year old children and could even be grandparents and then there will be a few like me who have 2 year olds and everything in between. I don't know if anyone's life turned out exactly like they thought it would on graduation day. The day I graduated - I planned to go to OBU, meet my husband, become a doctor (ha ha ha ha! yes I was pre-med for 2 years), have children as soon as I got out of med school - by 26 or so and live happily ever after. God knows the plans He has for us. My life didn't turn out anything like I thought but I would dare say it's much better. I certainly never dreamed I would be having my first child at 35. But I'm thankful and blessed for the road God has taken me on. I can't wait to see what lies ahead. What about you? Did you life turn out like you thought it would be on graduation day? I just attended my 20 yr reunion on Saturday. I can't say my life turned out exactly like I had it all planned at that time in my life, but I am happy and very satisfied with the direction that God chose to take it. I had a blast at my reunion - I also had a very small class, just 27. I loved school all the way thru - not sure I would want to go back, but I do have some great memories! I have recently blogged about the prepartion for the reunion, and just posted post-reunion pics. It was so much fun catching up w/everyone again. Does anyones? Mine sure didn't and I'm the epitome of a Type A planner. One thing I know is that I'm sure glad it didn't - I'm not good at planning my life. I don't know what is best for me like God does. I'm exactly where I need to be - even though I didn't plan it this way! My life is just like I planned... only, it took 18 years to get there rather than 4. I always knew I wanted to teach high school English. However, I let many people, including the high school teachers I admired, talk me out of it. Then, life got in the way and I could not just stop working and helping to support my family to go back and get that degree I always wanted in English. I lost my job after 9-11 and could not find a comparable position in marketing. So, at my husband's suggestion I went back to college and finished my degree in English and am now about to teach my 5th year. So, the end result is what I wanted... but it was a wavy and often broken road to get here... but I do appreciate it all the more. I don't think it ever turns out like you think it will. I thought i would go into nursing but graduated with a teaching degree! I thought i would have three kids by now but still working hard for the first one! By the way, looks like ya'll had a lot of fun at the slumber party.. Just got back from my niece's 3rd birthday and she was dressed up like a princess all weekend long! 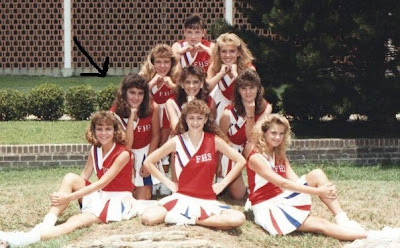 Kelly, I LOVE the cheerleading picture. I agree about spending so much time on our hair...but fluffy yet stiff bangs were SO important! I totally understand about never planning another high school reunion. I graduated in '91, too, from a rather large high school. I had 350 classmates. I helped plan our 10 year reunion and I will NEVER do it again, either. WHAT was I thinking? No way! I never imagined I would get married so young! I would not want to go back to highschool if someone paid me to....our graduating class was over 600 and I doubt anyone knows my name because we are just known as the "twins". ha..ha..
but it is fun to see how everyone's lives have changed! LOVE the old pics, share more!!! No way - I graduated in 1989 and we had over 600 in my graduating class. I haven't attended any reunions b/c I live so far away. If you would have told me I would be married to a pastor, I would have never believed it. I guess that's just God's grace! I guess my life is about 50/50 what I thought it would be. I can definitely say the 50% that I didn't expect has been much sweeter than I could have ever dreamed...even with autism. God is good and I am grateful! I am loving these old pictures. Keep 'em coming! Oh, and BTW, I am totally addicted to FaceBook now! Ha! I am still trying to figure it all out, but have already reconnected with some old friends. It's fun. Thanks for telling me about it! I guess my life has sort of turned out the way I thought it would. I just took the bumpy, hard road for a while! I thought I would go to college, meet a husband, become a teacher, have kids and hopefully be able to stay home with them some day. Well...I left college, had a baby, got married to my boyfriend from high school and got divorced a couple of years later. It took a few years for me to realize that my way wasn't the best way so I turned back to God. In the process, met a great guy, got remarried, had two more kids and am now a stay at home mom. Whew! Not even close!! But like you said God has different plans than we do. My plans would not have been near as great as what God has given me. I have been able to stay home with my 2 kids and help my parents in their business at the same time. Not what I planned but am sooo thankful for it!! Not even close! I planned on going to college, graduating, becoming a corporate head hunter, flying all over the country wining and dining candidates, never marrying, and absolutely no children. I really love the pics ;)!!! Honestly my life is not really what I thought it would be, BUT I would not change it for the world!!! Our 10 year reunion is coming up in 2010 and I can't wait to see everyone!!! In high school, a teacher made us write a letter to him pretending it was 2007 and we were coming back for our 10 year reunion. In the letter we had to tell him where we were and what we were doing. I saved it and found it when we moved a month ago. Crack me up! I was so off!!!! :) I'm much happier than if I had followed that letter! we just had our 20th and i think combining classes is a great idea. our class was small too. My life didn't turn out the way I planned, but I am so happy with it anyway. I joined Facebook today and I'm addicted. I found a lot of my high school friends on it. I think my life did pretty much turn out like I expected. I met Steve when I was 15 so I knew I wanted to marry him as soon as I got out of college (I actually married him after my junior year in college!) And I knew I wanted lots of kids, which I've got. There have been a few bends in the road, but it has all been a blessing. I'm thankful for the life God has given me. By the way, I had over 850 students in my graduating class. It was so much fun. I loved going to my high school reunions (10 and 20) and catching up with everyone. Even though it was big, we still felt like we knew just about everyone at some level and were excited to see how everyone's life has turned out. I can see a lot of you in myself...and NO, my life is NOTHING that I had imagined. I did plan to teach or be in education and I had hoped to do something with Dance. I received my Bachelors in Dance and my Masters in Ed Leadership. I am currently the assistant principal at a Performing Arts High School...and I TRY to stay out of the dance studios and visit the other 7 art areas at my school. So this part of my life to turn out the way I had hoped...on the other hand...babies...I was planning to have a few by now, but in His time!! 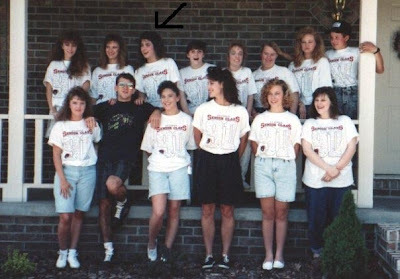 My HS class of '93 had 60 people. My plan was exactly like yours, except for the pre-med part. God allowed me to marry a week after OBU graduation but laughed at the rest of my plan. I never dreamed I'd be living in Rhode Island for 11 years or deliver my 4th child a month before I turn 34. It's been crazy. But I wouldn't change it. I had my 25 year reunion last year (I was/am the planner, too). Jodi and I had planned to move to Nashville after graduation and marry us some cowboys - ha! We never left Marion County... but I did marry a country man! Hi Kelly, we are from different parts of the country and I am 4 years younger than you, but some things don't change no matter where you are..I remember those bangs..I HAD those bangs..UGGG..and the cans of RAVE spray and DippityDo gel...remember that??? ha..too funny. You sure did have a small class.. We had over 100 I'm sure. Our 10 year reunion was weird. Some were like me, married, couple of kids, some were still the same and needing to grow up..and then..there was one that was in the process of becoming a woman (from a man). Oh the memories! And..actually, my life did go as I planned..for the most part. I guess God knew I couldn't handle change. But..I went to college, graduated in May, married in December, got pregnant in June....and have been an at home mommy ever since. Now for the change...I wanted to be able to stay home forever..but now is the time for me to try to find some work. This is not what I dreamed of, but I am ok with it so far. I know it will help us get out of debt. anyway..sorry, I RAMBLED..
No way! My life did not turn out anything like I imagined it would. I'm still holding out hope on a couple of things, though! Love the old pictures. Big bangs were the best! That is so true, God does mix it up on you.I too was a pre med major and I was going to be a Dr and wait to marry and have a family at least until my thirties.Well, I met Mr. Right and married at 23 and had a surprise baby at 25. Now 10 years later I have 4 daughters and stay at home full time.I couldn't imagine anything different! God is good!! !